The whole team at Delfland would like to wish you happy new year; we are currently working on plants for 2016. All the varieties have been reviewed and we are in the process of updating the website and that will go live soon. You don't have to wait to order spring garlic and seed potatoes as these are available to order now. We have a single variety this spring, available as single bulbs or in a box (500g). An Italian pink type that matures in late July. 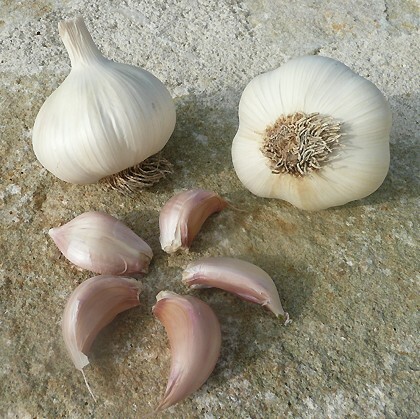 The white-skinned bulbs of garlic 'Flavor' each contain 9 to 16 pretty pink cloves that will store for a long time once ripened. All our potatoes are in 1kg nets, so you can ‘Pick & Mix’ several varieties; 1kg is about 13 tubers - enough for about 4 square metres (5 square yards). Multi-buy savings ~ buy more than one net of the same variety or across our range and save on each net. Potato delivery is based on weight, and it is calculated automatically as you add the nets to your basket. The banding is as follows: 1.0kg ~ £5.00; 2 - 3kg ~ £7.00; 3.5 - 18kg ~ £8.00. We suggest that you buy with some friends to take advantage of the discount. 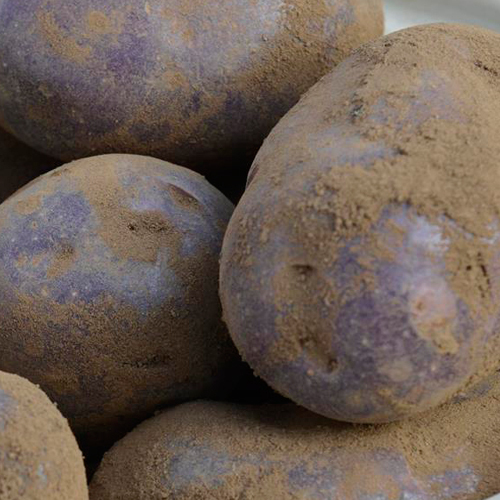 By special arrangement with Sarpo Potatoes Ltd. we are able to offer a range of late blight-tolerant seed potatoes. These varieties are the product of traditional breeding techniques, not GM. Please note that only Sárpo Mira is available as organic seed potatoes. These blight-tolerant potatoes are very easy to grow, with dense foliage that smothers weeds; they also store without sprouting. High yielding; can be stored until spring. 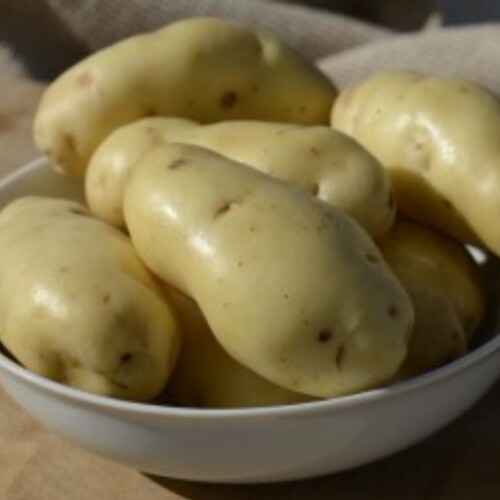 Available to order now ~ order Sárpo varieties Delivery from mid-February onwards to give time for chitting. Please note that only Arran Victory and British Queen are available as organic seed potatoes. 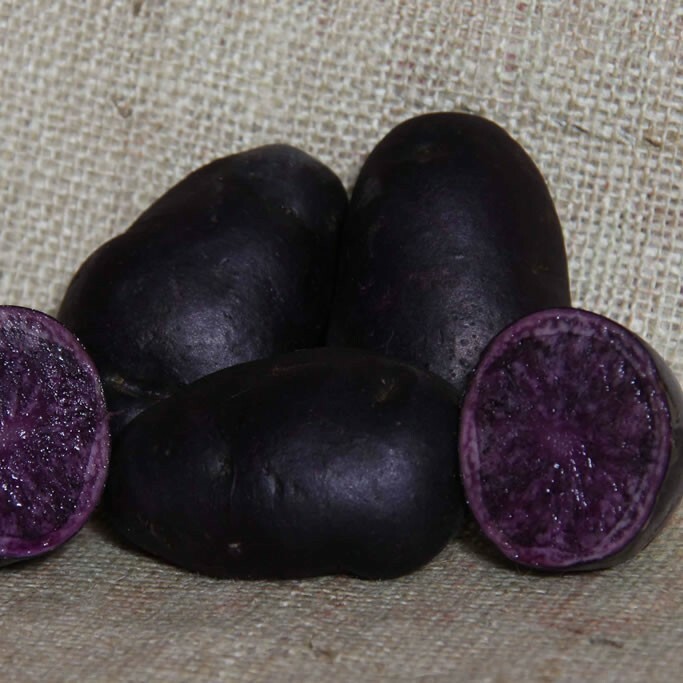 Highland Burgundy and Salad Blue keep their colour after cooking, so you can have pink and blue mash, chips or surprise jacket potatoes. Red skins and creamy white flesh are produced from a fast growing plant. Useful for colour in cooking when the skins are left on – the flesh itself has beautiful flavour when mashed with ample amounts of butter. 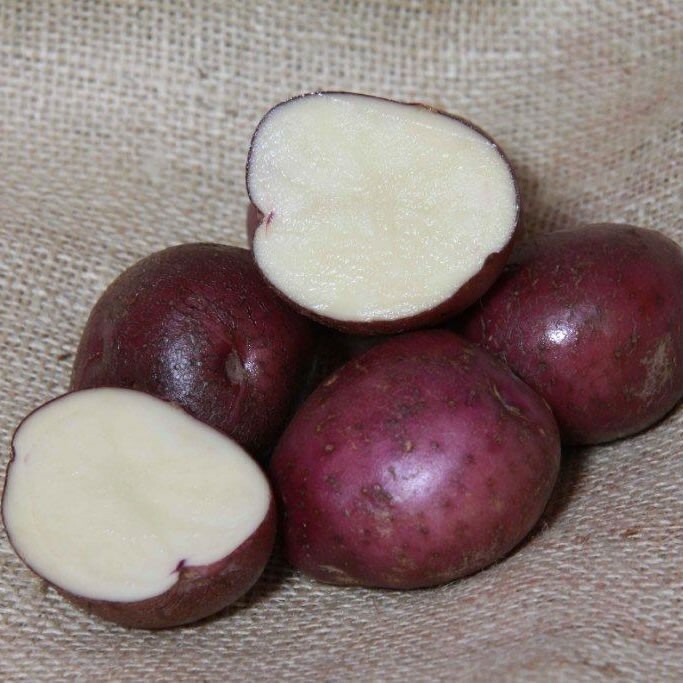 An oval white-skinned and white fleshed-potato is produced from this small grower favourite. Popular for its versatility in the kitchen – another potato which needs gentle simmering to produce excellent mash, and a great roaster. Blue skins and blue flesh make this a very popular novelty potato. 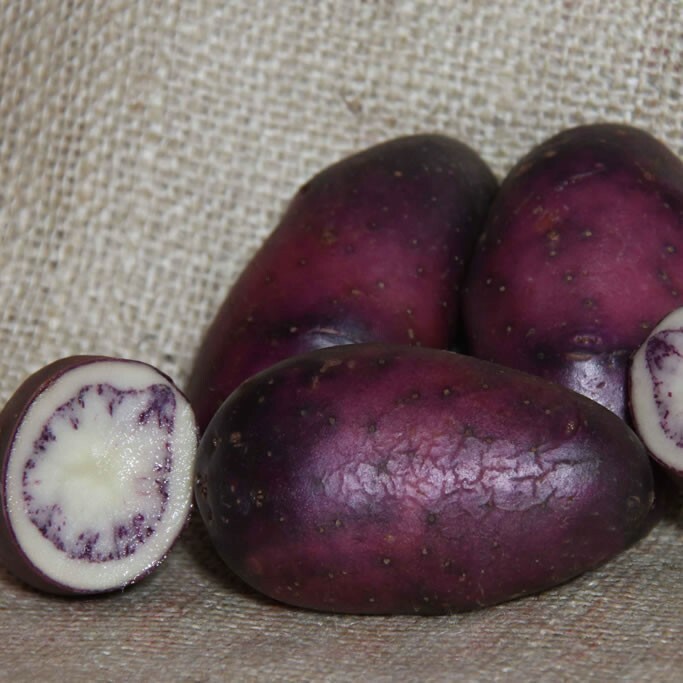 But there is more to the 1900s crop: a gentle flavour and good texture make this floury potato popular with chefs who know to avoid boiling and enjoy it fried or roasted. 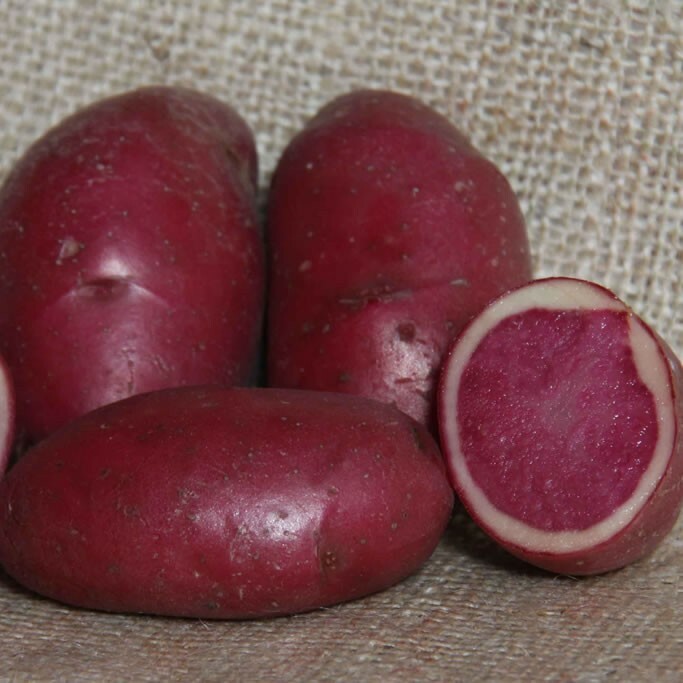 Named after the Duke of Burgundy, who was served this potato at the Savoy, this is a red-skinned potato which has burgundy-coloured flesh apart from a narrow white band just under the skin. This variety has a high dry-matter content, which produces a fluffy texture when cooked. Most of the colour remains after cooking, particularly if they are steamed or fried; makes good novelty crisps, chips and mash. Netted dark blue skin and yellow flesh. Around since at least the early 1920s; medium to long oval tubers and dark skin make for interesting cooking opportunities. Flavour is good and the potatoes are easily baked, crisped, chipped and roasted. 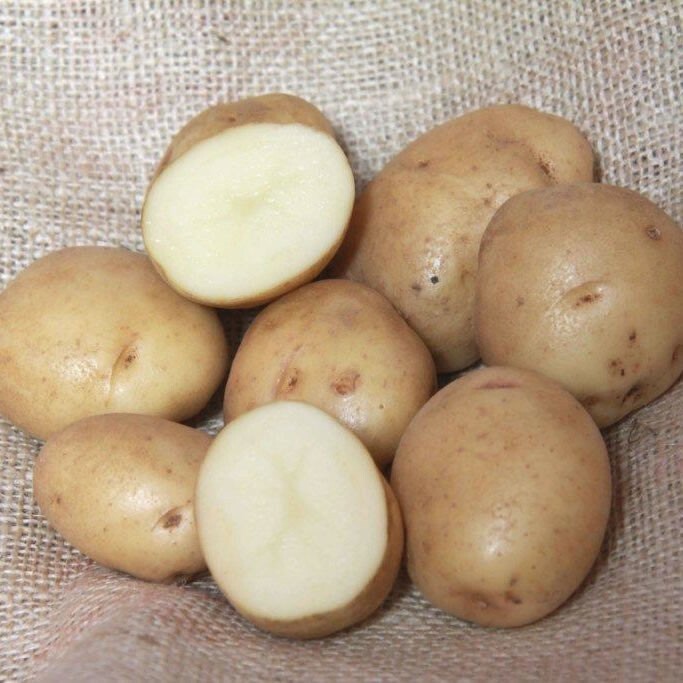 Well respected older variety named on the Isle of Arran after the first World War, this round to oval tuber has consistently been popular with growers due to high yields and long seasons. Distinct blue/purple skin covers white flesh. As featured on The Great British Food Revival - makes great mashed potatoes and roasts well. 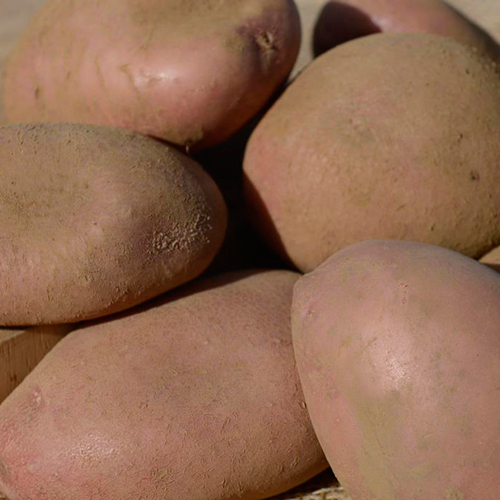 Andrew Skea, our seed potato supplier, says it is his favourite (and he grows dozens of varieties). 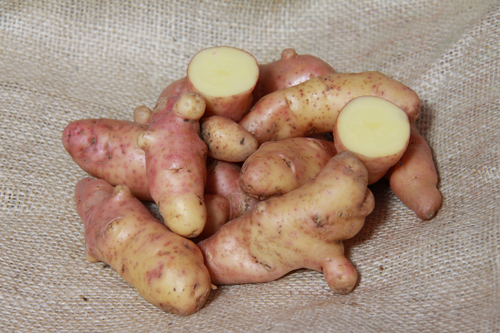 Very knobbly pink-skinned long tubers, yellow flesh; waxy firm texture so good in salads; delicious flavour hot or cold. 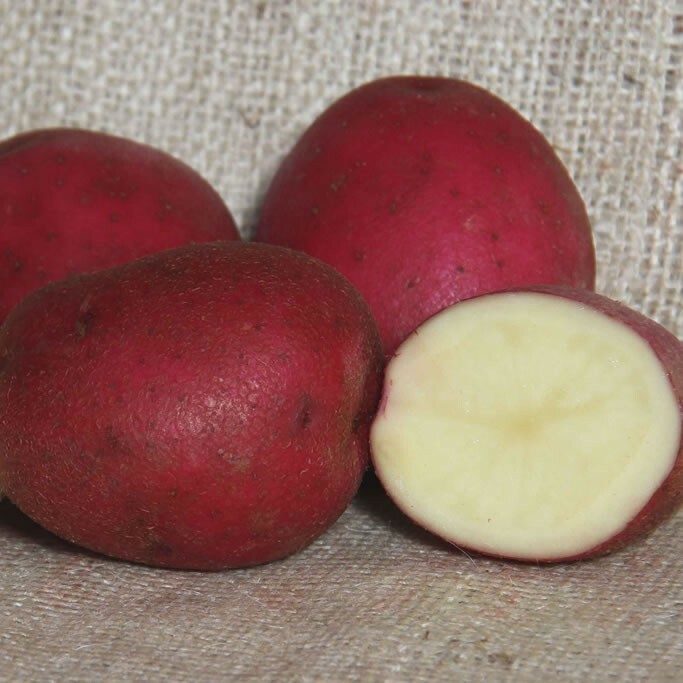 Ama Rosa and Terra Rosa are mid season specialty potatoes with red skin and red flesh. Tubers are ideal for microwaving, frying or baking. Chips made from them retain their rosy color and resist fading. The third variety is Karali, all will be supplied in 1kg bags, all will be conventional, we are waiting more information. 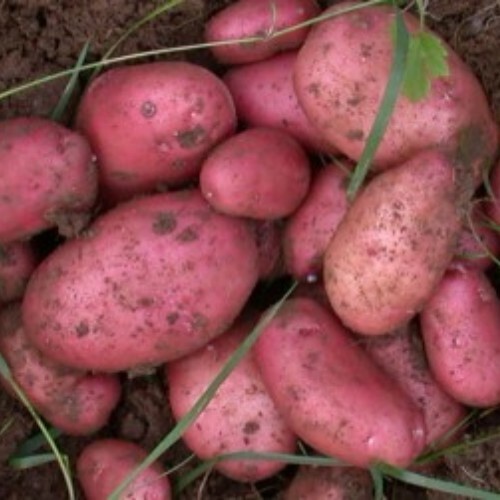 Organic Early maincrop ~ Pink skin and white flesh, high yielding with good taste, it holds its shape very well. To order follow this link ~ seed potatoes. Any questions, do give us a call or email us. Whatever you decide to plant this year, we hope you have a great harvest. Copyright © 2016 Delfland Nurseries Limited, All rights reserved. Thank you for your post about our potatoes and garlic. There were problems with the Sarpo seed production this year so we have only got Sarpo Mira and Shona as organic seed and conventional Axona. We've got small quantities of the trial varieties from Skea~ EM10 which we grew in our garden last year and which has a superb flavour, plus Ama Rosa, Terra Rosa and Karali, which we haven't yet trialled. The two 'Rosa' varieties have red skin and red flesh. If you are interested in orderering whole trays of veg plants to sell on to your members, please take a look at www.delfland.co.uk and give us a call if you have any questions.